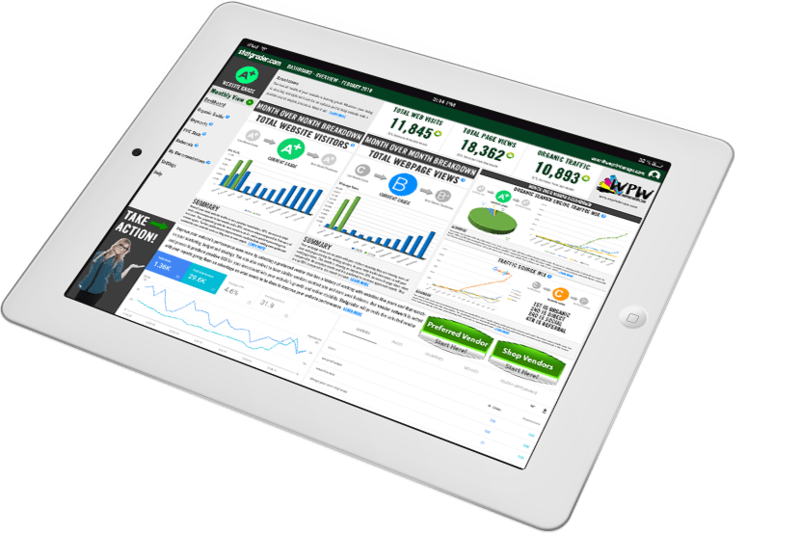 Introducing a revolutionary approach to website traffic reporting analysis. Statgrader tells you how your website is doing and gives you recommendations on how to improve the performance where it needs it the most. With many years in the digital marketing industry and providing SEO (Search Engine Optimization) services across multiple verticals and industries our team of analytic experts have come up with an answer to many website owner’s questions. Often analytic reporting lacks real value or is either very basic or way too complex for the end user to grasp. With that in mind we have come up with a way to provide on-going website analysis reporting that is simple to understand and it packs a big punch on the value ticket. During our many years of digital marketing work we found that many customers were a tough sale on SEO. They didn’t have the trust or know how to tell if they got a return on their investment. Furthermore, many told us they had been taken advantage of by a so called SEO expert and got nothing in return which made it even harder to convince them that we would be different. To gain that trust we had to come up with custom, simple to read analytic reporting solution which we manually created for each client we had. As a result we built a better relationship with that customer and they became versed in SEO terminology and gained an understanding of what it takes to improve the traffic to their website. For that reason we held onto customers for more than 10+ years and have many of them still today. We helped them realize revenue returns in the millions of dollars. The Statgrader website grading application is meant for everyone. If you have a website, you should be using this analytics tool. 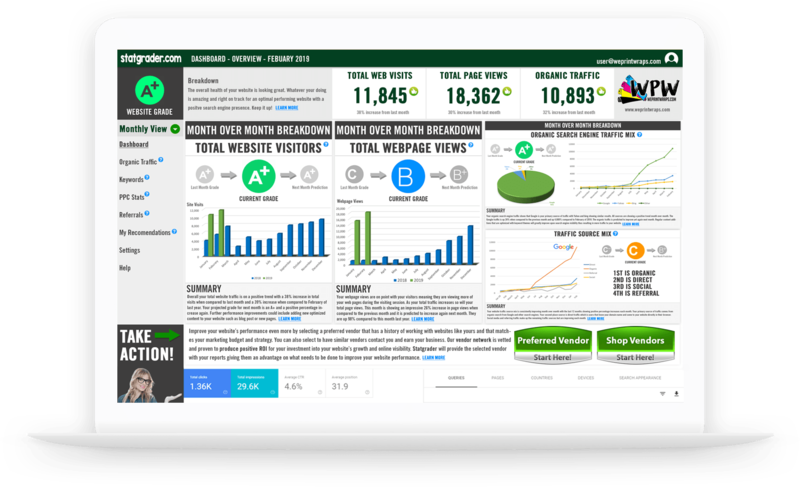 Statgrader makes it easy for anyone to visualize and understand how their website is performing based on the primary metrics from their website traffic and analytic data. Statgrader uses a grading algorithm to present performance grades for each of your traffic metrics. The grades and analysis provide real value for understanding where you may be lacking in performance. Additionally, the Statgrader platform provides recommendations for each metric on how to further improve the performance. The recommended action items are aligned with capable vendors that can implement results-driven digital marketing campaigns to achieve each goal. Since Statgrader is meant for anyone with a website, we made it very affordable. You can start for free and produce your first report in seconds. Going forward the website analytics tool will have a low monthly rate. No matter what kind of website you have, Statgrader can provide you with a low-cost solution to analyzing your website performance on an ongoing basis. Through our experience we found these scenarios to be present in almost every project we encountered. Many websites had “direct traffic” as their number one source of traffic. Many websites that had some SEO applied still had a lot of low hanging fruit available to increase traffic easily. Many websites that were custom built by a web-designer had multiple missing SEO best practice attributes missing. Most websites lacked the content they needed to be competitive in their target market. Most websites did not have any kind of custom analytic reporting setup. What do you mean by Custom Analytic Reporting? We could just have used the basic Google Analytics reports and emailed them to our clients, but we knew they would not easily understand them or find any real value in them. So we created our own custom reports using the data from Google Analytics and we presented it in a way that our customers could visually see value in the SEO efforts we had been implementing for them. Don’t get us wrong, Google Analytics is great and we love that it’s so powerful at data collection. We just know that it has its limitations on how the data can be viewed. Then we got to thinking, how could we help our customers or anyone with a website for that matter by providing them with an easier way to view their analytic website data and make sense of it? And then we would take it a step further by adding in a grading algorithm that would show them where the website sits as a whole and how each of their primary data segments look too. With this being possible, we could create a profile for each website and really understand what their strengths and weaknesses were. With this information at hand, we could align the Statgrader subscriber with a matching vendor that could meet their digital needs. Whether that be for SEO, Content Creation, PPC (Pay Per Click Advertising), Keyword Research, Design, Social Media, Link Building, and so on. We decided to add a summary to each data metric providing a recommendation or suggestion on how to further improve the results. We could then align that need with a specific vendor that can provide service for that metric or multiple metrics. Simple Right? Let’s say you already use an SEO Specialist or a Digital Marketing Agency to handle your website. With our solution you could run just one report and see what kind of job they have been doing. Far too often we have heard nightmare stories from clients that say they were taken advantage of by an agency or an individual. One of the most recent cases we heard of was one of our previous eCommerce SEO customers that hired an agency for Pay Per Click Advertising. They told us that they spent over $13K in 6 months on PPC. They reached out to us and asked us to review the analytics because they were not seeing a return. They provided us with some generic reports that the agency gave them. None of which stated clicks, spend, sales, CPC (Cost per Click), etc. We hopped in and wanted to verify if they had set up UTM (Urchin Tracking Module) tracking within their GA (Google Analytics) account. We found nothing setup. There was a landing page created for the campaign that did have traffic to it. We then connected the landing page to the order confirmation page and found that not a single AdWords click had ever made a purchase in the entire six month period. The customer could have just as easily lit their money on fire and posted it on YouTube and gotten a bigger return. If they had Statgrader they could have it analyzing their campaign right from the start. If it’s a question of access to the data, you can make your own call. Would you do business with someone that didn’t give you access to your campaign data? I think most of us would not. Statgrader is meant to help everyone and essentially weed out agencies and freelancers that take advantage of unknowing business owners. We think it’s time to hold these companies accountable for their actions and making what we love to do so difficult and that’s to provide reputable digital marketing service and get credit where credits due. What else can Statgrader do to help with my website performance? We plan on implementing a benchmark system and an awards system. The benchmarking will look at multiple demographic data and rank your website against others like you. For example, if you’re a plumber in Phoenix, AZ, we could rank you as your website performance compares to other plumbers in your market, state, region etc. With more demographics such as age, gender etc. showing you how your brand sits in comparison to your competition. You would know if your in the top 10% or the lower end of the scale. We could then match you with a vendor that has a history of improving your website performance based on the benchmarking data. The awards system is meant to reward you for improving your website performance. Over time as you take action and reach milestones we would reward you with a discount or free month(s) of service. This is to encourage you to take action. SEO is not a one-time thing and there are always ways to increase your traffic performance and rankings. How will Statgrader match me with a Vendor? We built a database of vetted vendors that perform the services we recommend for improvement. We set a profile for each as we do for your statgrader website account. The idea is if you want to work with a local freelance or agency and your budgets match then we want to align you with the best one possible. As vendors perform services for our subscribers we track your website analytics and build a report based on their implemented work results over time. For example, if you hire one of our vendors to do SEO and we see a significant increase in organic traffic/rankings over time we will be able to rate that vendor based on the results. The idea is if your an oil change shop, we want to align you with a vendor that has a good rating for improving oil change shop website performance in your market. Statgrader is not meant to force you to use our preferred vendors. That is just our initial recommendation based on the data we have about your website analytics and profile. We will also give you the option to choose from others and have them connect with you to earn your business. How does Statgrader generate a grade for my website metrics? Our advanced algorithm looks at your historical data and trends and is able to provide a simple grade for each metric segment. Statgrader also looks at multiple data metrics at once and determines the most appropriate action recommended to improve the results. 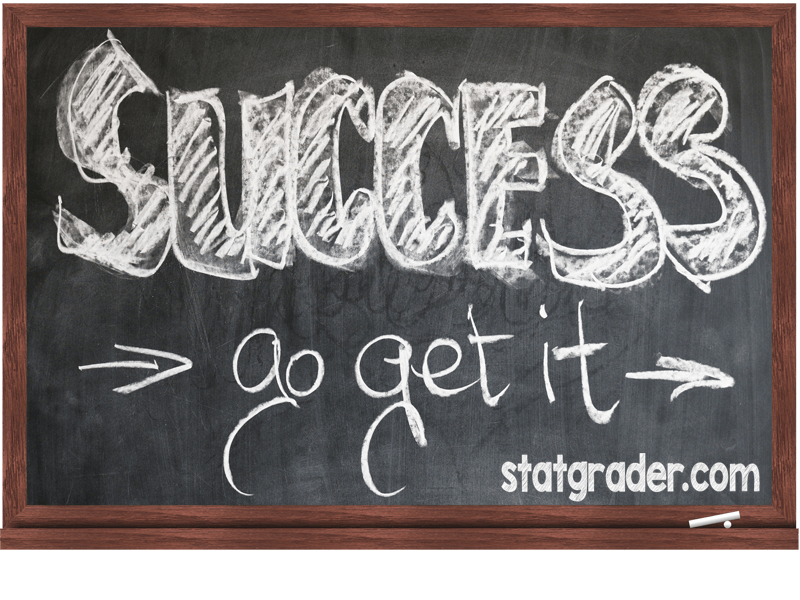 Statgrader is designed to show you how to reach that goal the most effective way possible and provide you with a solution to use to take action immediately. How will I know if my website is performing well? Over time your website grades will change. Our ranking metrics will look at your grades and provide you with an overall score. It requires time to provide the most accurate analysis. To start, even if you have a lot of traffic it doesn’t necessarily mean that your website is going to automatically be a grade A+. We will need multiple 30-day data sets to produce an accurate gade for your website. So How Will I Get My Grades? We plan on offering a free 30 day trial of Statgrader to anyone who wants to see how it works and the value this analytics reporting application can provide you. The 30-day trial will pull up to 60 days of your past analytic data from Google Analytics. The trial will analyze the data and present grades for your primary metric data segments like site visits, page views, etc. If you upgrade to a paid account during or after the 30-day trial, Statgrader will pull your entire Google Analytics history and produce a new report for you showing the new data set. Your Statgrader account will not show you your overall website grade until you have used the application for at least 90 days. We require this to fully analyze your current website traffic to effectively produce an accurate grade based on current statistics and your historical grades in the application. You can get your website grades in two different ways. Statgrader will email your full report every new month. You can log into your Statgrader Dashboard and view your reports anytime. Ready to See Your Grades?